Writing a personal statement for a residency can be a tricky task to accomplish, especially when writing a pediatric residency personal statement. This work may turn to be complicated as with any residency personal statement because you have to explain and describe the reasons as to why you are attracted to this field and why you think you will be a valuable addition. Creating personal statement for residency is not easy. In the busy lives of medical students, it can seem an almost impossible task to write a pediatric personal statement, which is where recruiting a professional writing service comes into play. Residencypersonalstatements.net offers a professional writing service that specializes in residency personal statements, including pediatric residency personal statement writing services. Massachusetts General Hospital: this program will be able to provide you with a wide range of experience through their sizable facilities. University of Pennsylvania: this program supports some 148 interns and residents within their 3 years programs as well as some longer programs in different specialties. University of Cincinnati: ranked highly not only as one of the best residencies in the country but also as one of the best children’s hospitals. University of Colorado: the faculty that you will be working with are some of the most gifted and respected in their respective fields. Johns Hopkins University: if you are looking for a residency with a little history then this program has been running for over 100 years. UCSF: with a huge and diverse community at your doorstep you are going to have many opportunities to build a lot of experience. University of Pittsburgh: as the only children’s hospital in the region you are sure to be exposed to a wide variety of cases during your training. 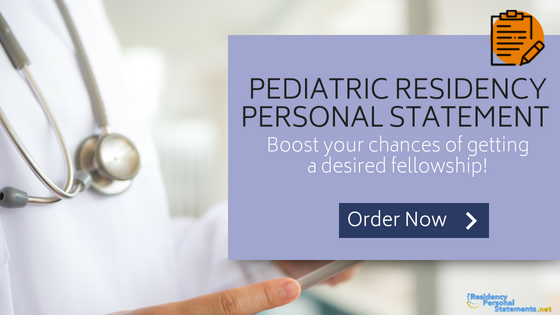 How Should You Organize Your Pediatric Residency Personal Statement? Introduction: give them a clear understanding of the reasons why you want to study pediatrics and what you have already done. Tell them why you are going to be a good pediatrics doctor: explain what it is about you that will make you excel in this specialty. What you are looking for: tell them the areas that you are particularly looking to learn about and also what it is that you will contribute to the program. Show your career ambitions: give them your personal goals for the next 5 to 10 years so that they understand what is driving you. What Mistakes Should You Avoid in Your Statement? Don’t simply repeat information that has been listed in your resume or elsewhere in your application. Never complain or make excuses within your statement. Don’t use clichés or make statements that are basically obvious. Don’t use language that is not going to be understood such as slang. Don’t allow mistakes to slip in: always carefully proofread your writing. At Residencypersonalstatements.net, we understand how busy and stressful the life of a medical student is, which is why we stand behind the value of providing a professional residency personal statement writing service that is molded around your budget. Our professional writers will assess your residency personal statement and determine the services that you need most in order to stay within your budget. We believe in making your pediatric residency personal statement a realistic expenditure on your quest to being offered a residency. At Residencypersonalstatements.net, we hire only the most qualified and highly trained professional masters and PhD level writers to guarantee your 100% customer satisfaction when you receive your personal statement or your money back! Our professional residency personal statement writers are all put through a rigorous qualification and training process before we assign them to an account. When we assign a writer to your account, you receive personal service and customer support from your personal professional pediatric residency personal statement writer. Guaranteed to be delivered within your agreed deadline. Guaranteed to be unique with no copying: delivered with a plagiarism report. Guaranteed free from issues with free proofreading on our services. Guaranteed satisfaction with your pediatrics statement or your money back. Get in touch with our highly effective writers today to make sure that you submit a pediatric residency personal statement that will get you the ranking you are looking for.